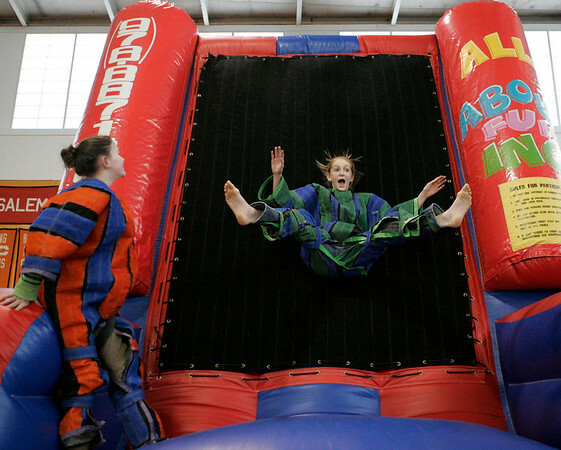 Beverly: Hannah Burke, 12, of Beverly, left, watches at Tasia Kendall, 14 of Gloucester sticks herself to an inflatable velcro wall during All About Fun Inc.'s fundraiser for the North Shore Music Theatre held at Beverly High School Saturday. All About Fun is a party rental company located in Boxford. They have taken direct action to help the North Shore Music Theatre with their ÒSave Our TheatreÓ Campaign. The event featured an obstacle course, sumo wrestling, carnival games, food and face painting. Photo by Deborah Parker/Salem News, Saturday, January 17, 2009.